The Volkswagen emission scandel ought to be condemned. However, with the weaknesses of the Anglo-American corporate model one should be careful not to dismiss Volkswagen's insider system of governance. 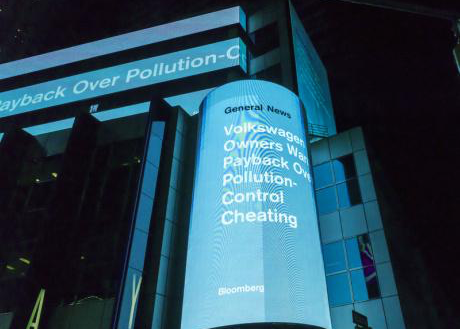 The Morgan Stanley news ticker in New York reports on the Volkswagen emission scandal. Richard Levine/Demotix. All rights reserved.Das Auto is causing angst. The Volkswagen scandal is undoubtedly disastrous on many levels. Arguably, no other company is so linked or advertises so widely with the label "Made in Germany," as the Wolfsburg carmaker. That Volkswagen now, of all companies, got caught cheating to the detriment of people's health and the environment, could tarnish Germany's political and corporate reputation. But whereas the storm of critique is only too understandable in light of the magnitude of the scam, it's misguided to cast aspersions on Volkswagen's model of corporate governance. The patriarchal corporate culture surely needs to change, but the insider system of corporate governance in many ways embodies the core of the German economic model. The current scam and a scandal-ridden past propel Volkswagen's model of corporate governance to the centre of attention. The Financial Times demands an upgrade of the "whole corporate structure," given Volkswagen's historically undervalued stock. And indeed, the firm's ownership structure and internal power balance are an external investor's worst nightmare. The state of Lower Saxony holds a 20 per cent blocking minority. This government ownership is enshrined in the so-called VW law, which the EU Commission challenged unsuccessfully, not least due to Angela Merkel's support of the status quo. Labour union representatives are so powerful within Volkswagen's corporate governance arrangement that observers call it "co-management" rather than co-determination (the long-standing arrangement that ensures labour's say in corporate decision-making through works councils and half the seats on supervisory boards). The two owner families, Porsche and Piëch, control more than half the shares with voting rights. With Qatar’s sovereign wealth fund holding a 17 per cent stake, just above 10 per cent of Volkswagen's shares are free floating or subject to potential speculation. All of this reeks of insider collusion and a lack of transparency, especially to Anglo-American observers. If you don't have to open your books to external investors, a lot can be swept under the rug. Volkswagen Glass Factory. Francesco Bencivenga/Demotix. All rights reserved.These arguments are reminiscent of the debates about the so-called "Deutschland AG" in the 1990s. A close-knit network of corporations and banks through seats on supervisory boards and cross-share holdings, made corporate Germany the poster child of an insider system. It wasn't until 1994, for example, that Germany had its first insider trading law. Corporate scandals combined with the emergence of the shareholder value mantra and an unprecedented equity fever, swiftly led to the liberalization of the country's corporate governance regime. Politicians across the spectrum, business leaders, and even unions sought to put an end to the old system. The initial euphoria soon gave way to sober reflection on the merits and weaknesses of the Anglo-American model. Dispersed shareholding, high levels of transparency, and strong market pressures, it turns out, aren't a panacea either. Daimler, a pioneer during Germany's financialization, got a bloody nose for its misadventure with Chrysler. The burst of the New Economy bubble in 2002 hit private savers hard and made them flock back to bank deposits and Bunds. Even chief architects of Germany's financial liberalization, like the former CEO of Deutsche Bank, Rolf Breuer, came to regret the rash break with the old model of "Rheinish capitalism." The old insider system might have actually constituted a comparative advantage. Relatively small and illiquid capital markets, concentrated ownership with long-term shareholders, and strong union representation, shield firms from market pressures and are highly conducive of patient capital. The permanent pressure from external investors and the tendency to think from quarter to quarter in more "financialized" economies, hardly foster long-term investment (note that this doesn't necessarily apply to private equity and venture capitalist practices). Hillary Clinton recently raised this "short termism" issue as part of her economic platform in the presidential primaries. It's not surprising then that Volkswagen, a company that due to its ownership structure continues to operate under an insider-dominated system, has the largest R&D budget in the world. Volkswagen doesn't have to obsess over stock price developments (which could change in the face of looming fines in the US and elsewhere). The seemingly anachronistic stakeholder system is part of the explanation why Volkswagen continues to manufacture in Germany (the share is decreasing though), pays high wages to its factory workers, and has managed to grow into the world's largest carmaker by cars sold. 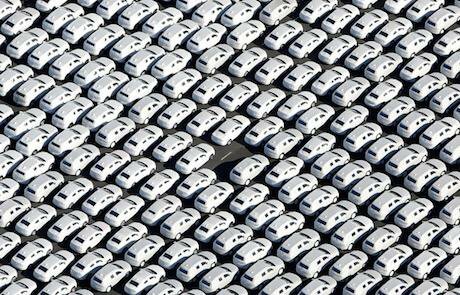 New Volkswagens stand ready for shipping in Emden, Germany. Jordi Bernabeu Farrús/Flickr. Some rights reserved.Germany's relatively successful recovery after the global financial crisis demonstrated its strength stemming from diversity. The diverse mix of successful small and medium sized companies ('Mittelstand'), capital market-oriented global players, and family-owned corporations such as BMW or Volkswagen, is an important part of the country's economic model. Angela Merkel was right when she told Tony Blair "we still make things." Among rich countries, only South Korea's share of manufacturing in national output is higher than Germany's. 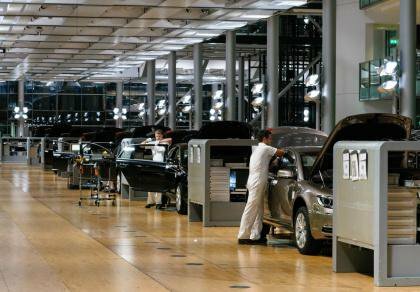 Volkswagen embodies the often-praised industrial core of the German economy that is on the bright side of the country's creeping labour market dualization. This is not the time to be apologetic or patriotically defensive. The emissions scam ought to be condemned. Too many jobs, too much confidence, the environment, and people's health are at stake. One can only hope that the new CEO will make good on his promise of a "relentless investigation" and succeed in changing the corporate culture. Yet even in light of the current scandal, one ought to be careful to blame the firm's insider-dominated system. No model of corporate governance can prevent scandalous misbehaviour. In a 2009 study of corporate governance practices among Germany's 30 largest listed firms, Volkswagen unsurprisingly ranked dead last. At the top of the list, however, we find a company that may be an overachiever in terms of transparency, but hardly made a name for itself in corporate responsibility in the recent past: Deutsche Bank. Volkswagen's Diesel scam is an issue of ethics, corporate culture, individual failure, and deficient oversight; it's not the outgrowth of the corporate governance system per se. Instead of indiscriminately calling for the end of the insider model, we need to ruminate on how to maintain its strength—the provision of patient capital—whilst preventing this series of scandals at Volkswagen from perpetuating itself.